I hope you are enjoying the spring weather. I LOVE sunshine and flowers! Oh boy, time for lots of flower cards!!!!! 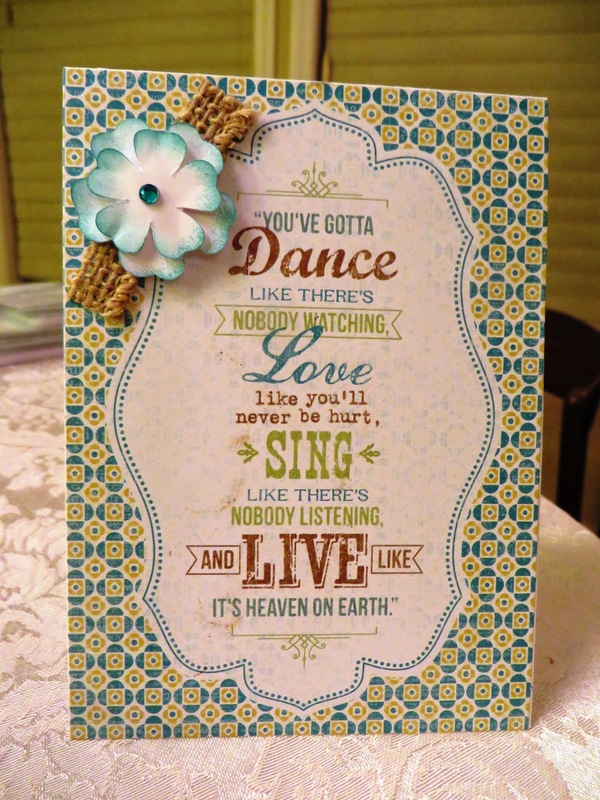 This month we are doing a card that was inspired by my downline Michele. 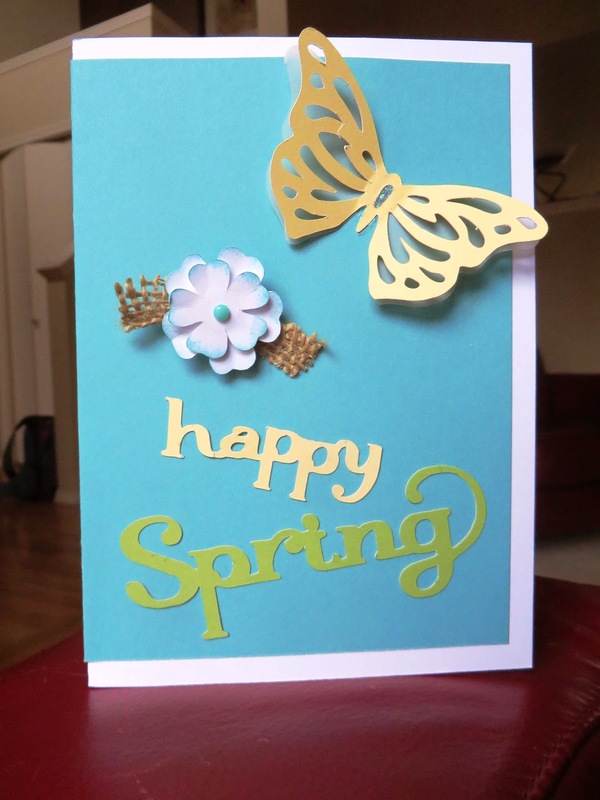 And no stamping is required - just cutting and some Cricut shapes. I liked that I didn't have to stamp anything. But that's not the fun part. The fun part is on the INSIDE! 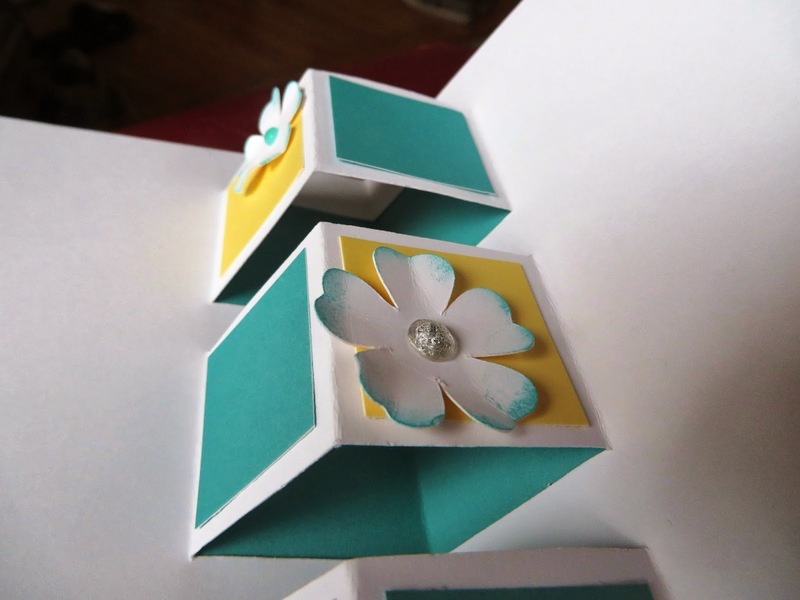 And here's a close up of the flower I did on the inside. A little sponge dauber and Lagoon Ink, and a little bling. LOVE bling! 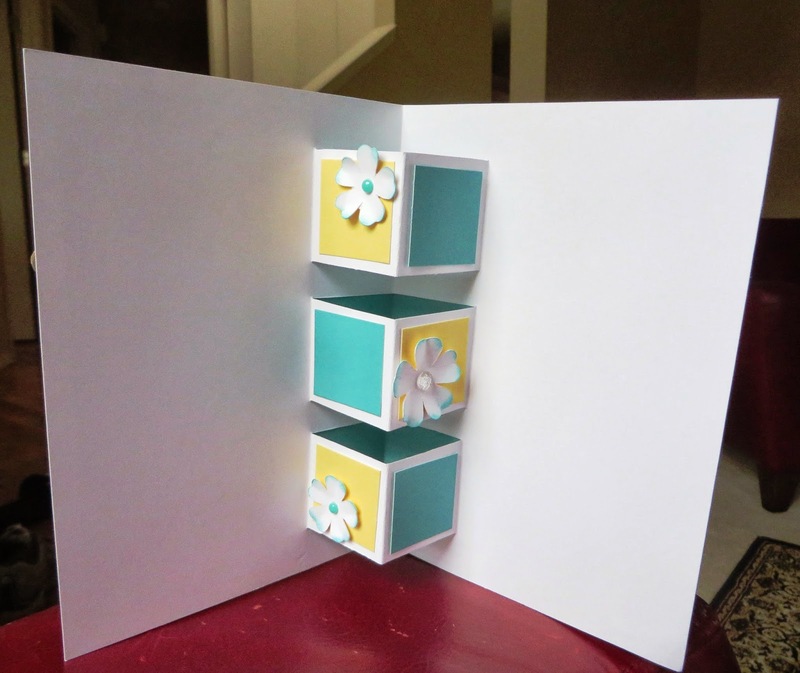 To make the squares, you just cut parallel lines in the fold of the card to make the 'boxes'. Then push the 'box' into the card instead of out. My squares were 1 1/2". Neat, yeah? 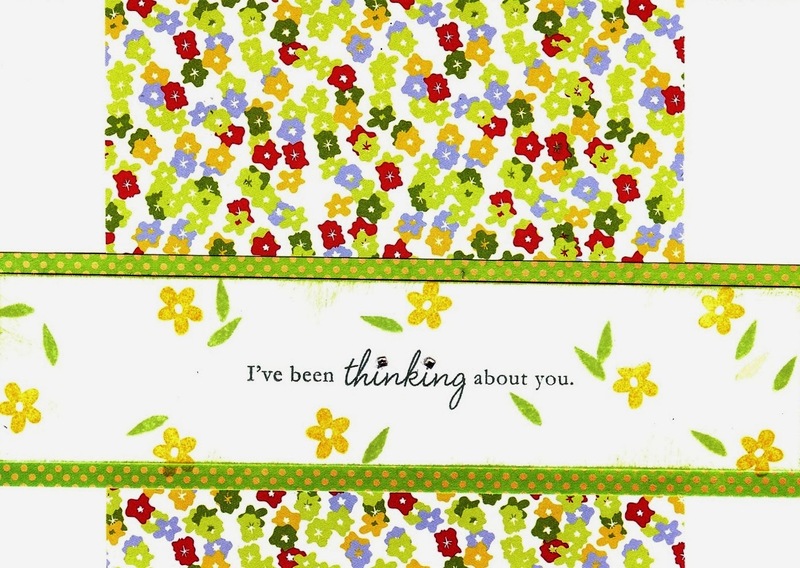 Want to make this card for yourself? Live in the Seattle area? Come to card class at my home in Newcastle! Tomorrow, Thursday, March 27 at 10am or Friday, March 28 at 6:30pm. Email me if you want to come. I will post a tutorial in the next few days. I'm planning on posting again soon...and MORE often! Thanks for being patient with me. 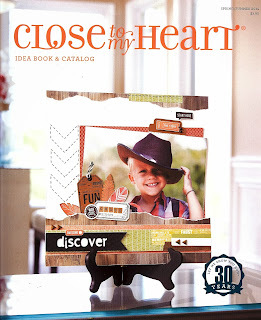 The Close To My Heart Spring/Summer catalog is always my favorite. I love the flowers, bugs, and springy colors. This year is no exception. I tried inking the entire stamp with Saddle, and that looked ok, but I wanted to try making the outline of the flower orange. So I inked the entire stamp in Sunset Ink, then carefully "rolled" the edges of the stamp in Saddle Ink. 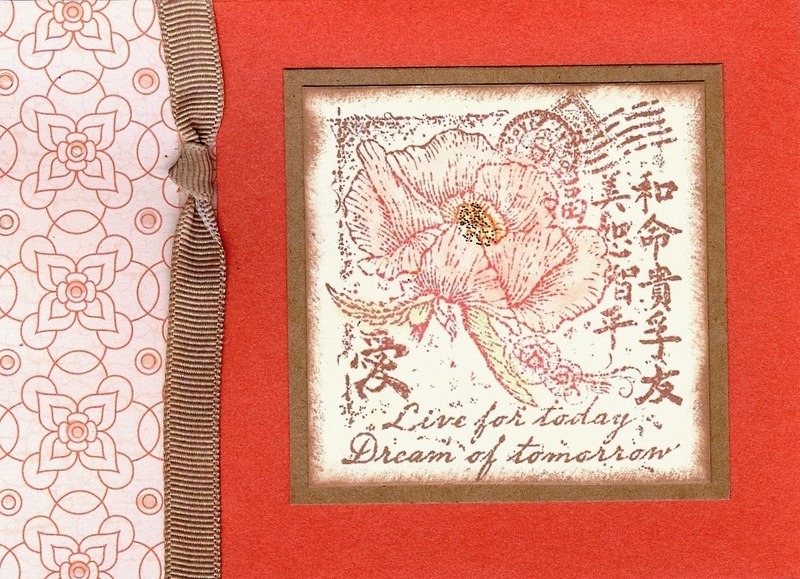 I had to make sure to "hit" all four corners, the Japanese characters, the postmark and the English sentiment at the bottom with Saddle, so it would be darker than the flower. I like that look better than the single color. Alternatively, you could ink the entire stamp in Sunset, and use a sponge dauber with Saddle on it to go around the edges. Better control of the ink, I think. I then used craft chalk (CTMH used to carry them ages ago) to color in the flower and the leaves. It gives the image a wonderful, soft look. I love using chalks...plus they are very forgiving; you can be pretty imprecise with them (unlike markers). I also sponged around the edges of the stamped image (with Saddle). 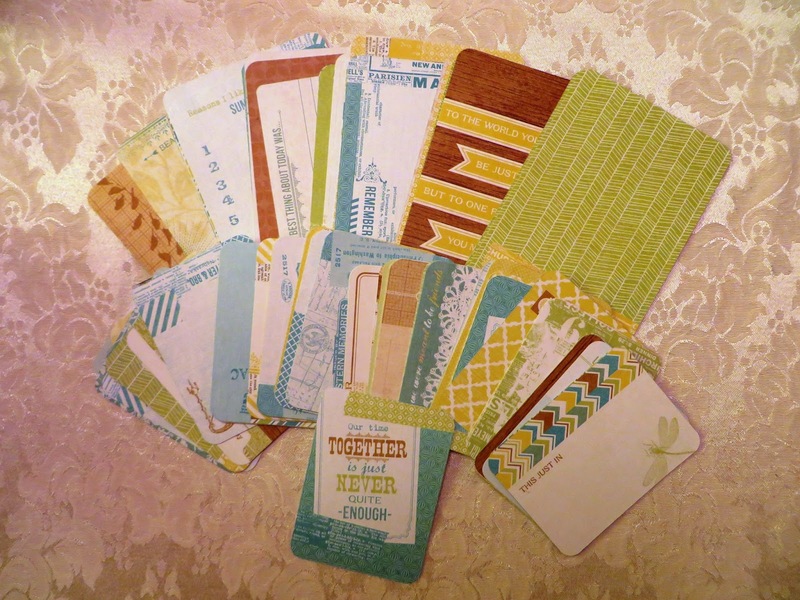 I used paper from the new Balloon Ride Paper Pack on the left and Sorbet card stock on the right. The mat under the flower is Desert Sand (but Kraft works great, as well). The ribbon is 3/8" Colonial White Grosgrain Ribbon (retired), which I inked with the Saddle Ink and a Sponge Dauber (love 'em!). I used Miracle Tape from Viva Las Vegas Stamps (http://www.vlvstamps.com/) which is like Terrifically Tacky Tape or 'redliner tape' (but cheaper) -- to stick the ribbon to the card. Plus, Miracle Tape comes in a huge assortment of widths! I hope you are inspired to try "rolling" your stamp today! 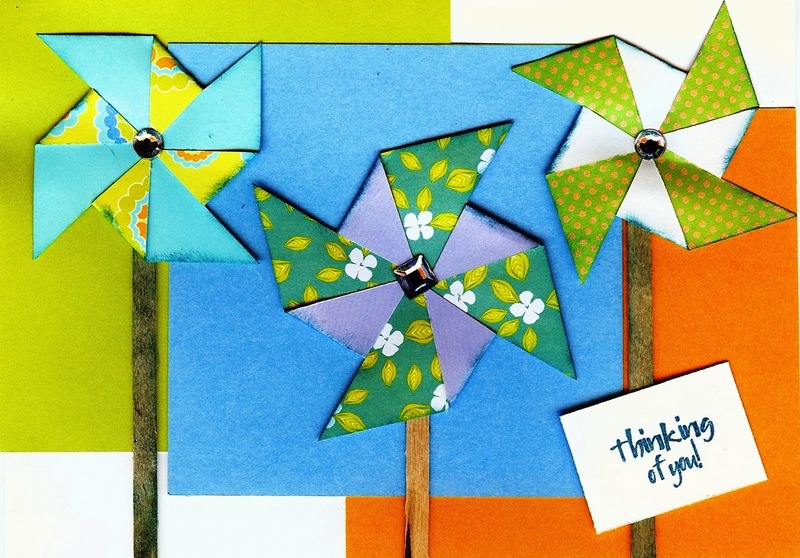 You can make pinwheels with squares (like when we were kids)...just cut from the corner in towards (but not all the way) to the center of the square. I glued the pieces down. These pinwheels don't spin. Rhinestone sparkles are embellishing the centers. The sticks are wooden coffee stirrers (nice and flat). These papers are from Rubber Soul's collections...Meadow's Edge, Hoop-La and Shake It Up. I really like how the colors go together in their paper sets. There's a bunch of different patterns in a pack. I stamped the little flowers and leaves on the white strip (above) using Close To My Heart stamps and inks (Pear and Honey). They match perfectly!! 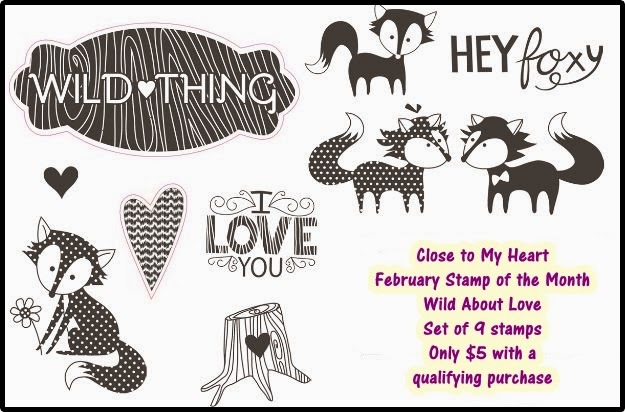 Have you seen the cute February stamp of the month? it's called Wild About Love. You can only get it during February. It's $17.95 if you just buy it, but the best part is, you can get it for just $5 when you place a $50 order! woooooooo! This is the cutest Stamp of the Month in this catalog. Here's a very simple card made with the set. 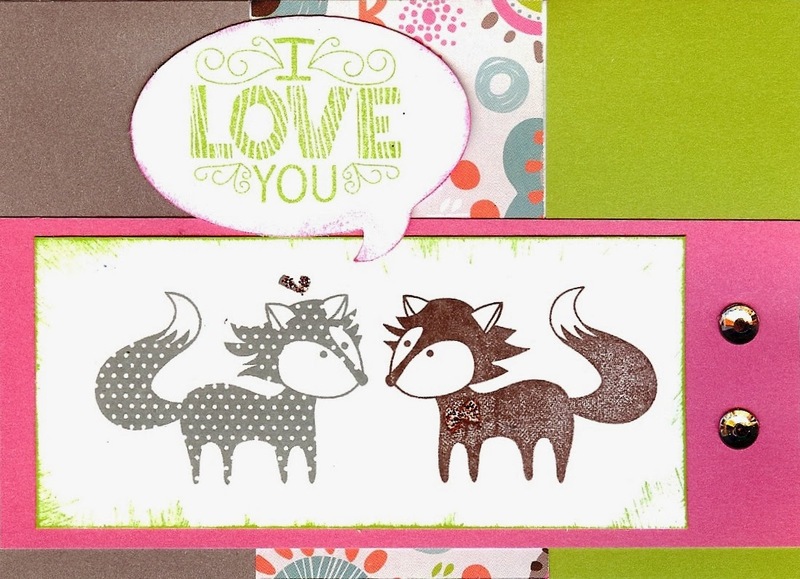 What was kind of cool about it was that I stamped the fox on the right with Cocoa ink and the fox on the left with Slate ink. 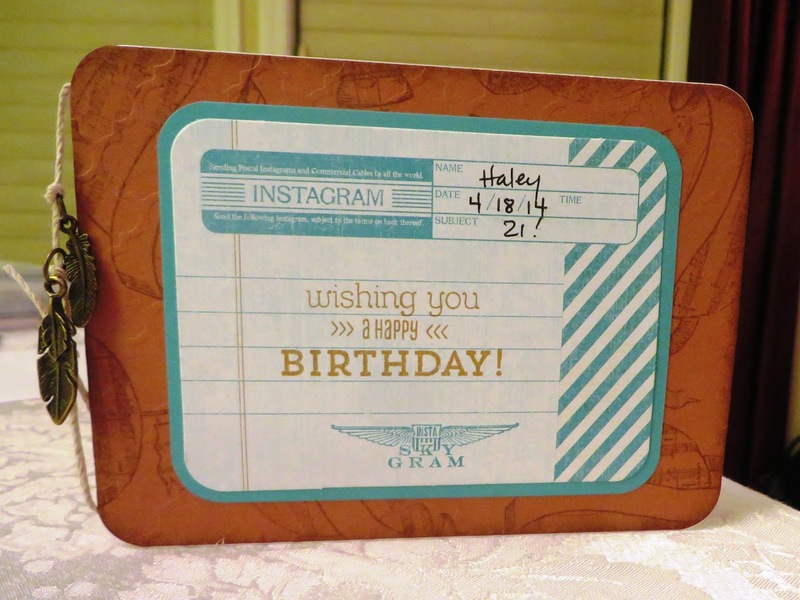 I didn't even need to cut the stamp apart...just inked separately, and stamped quickly. I used the NEW paper pack, Lollydoodle (X7183B, $9.95). 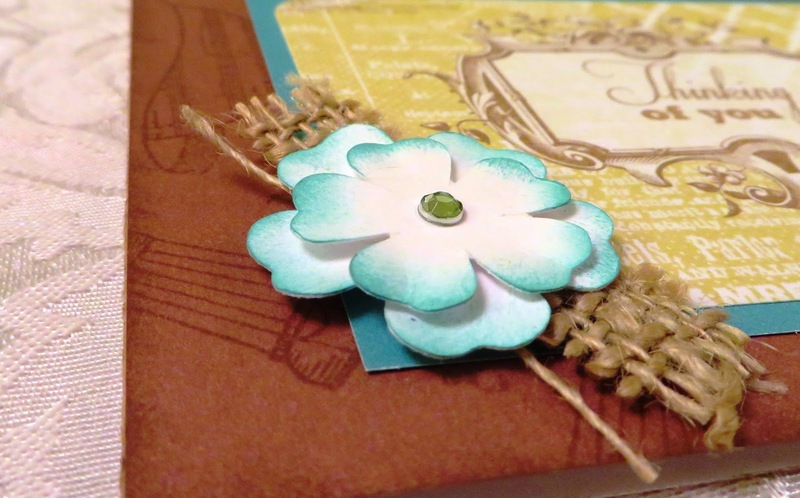 There's a fun blog hop going on...if you want to check out some other creations. Check out Gina's blog. and go around in a big circle. Happy Valentine's Day! The kit includes: The stamp set (above), 2 sheets of the paisley (front side) and purple (back side) paper, 5 sheets of coordinating card stock, 15 White Daisy cards and envelopes, 10 yards of grey and black Baker's twine, 108 purple (rhinestone) gems, instructions (yay!). You can make 5 each of the cards above. All for just $24.95! Don't wait too long, it's retiring on 1/31/14!! 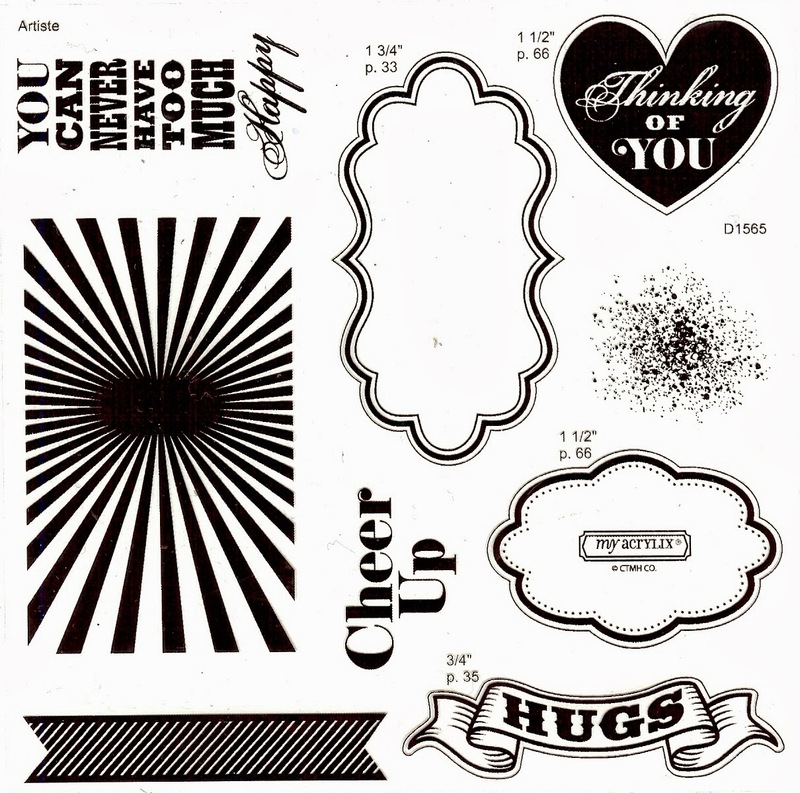 6 months ago, we made the "Cheer Up" card (above) in class, which is really cute. 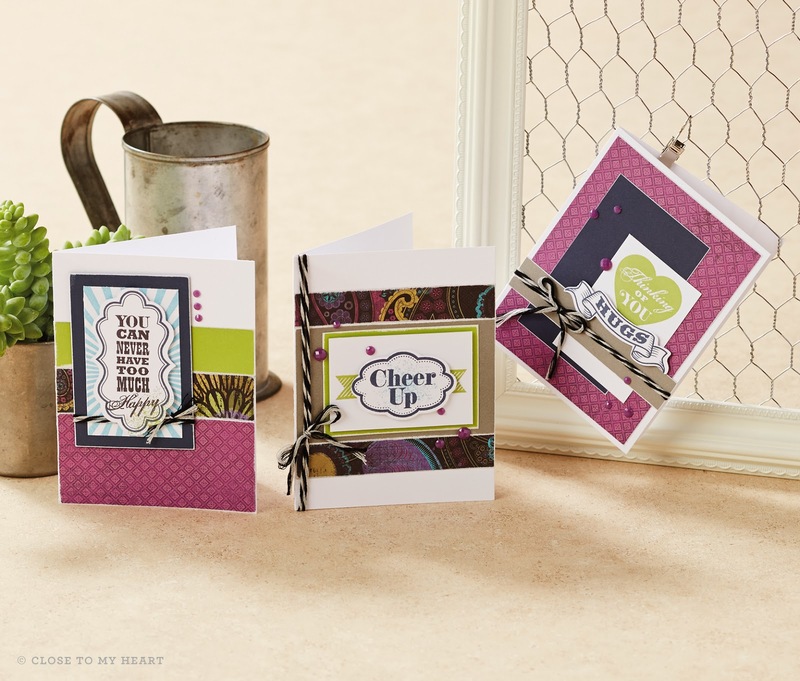 You can change the sentiment so that it works for you (which is what I love about stamping). You know this sentiment is true! I LOVE flowers (as you know); I cut these out with the Cricut (Art Philosophy - 3 sizes: 3/4", 1", 1 1/4") and layered them up with puffy tape. I bent the petals up (gently) so they would be curved up. The purple rhinestone you see (lower right flower) comes in the Laughing Lola workshop. 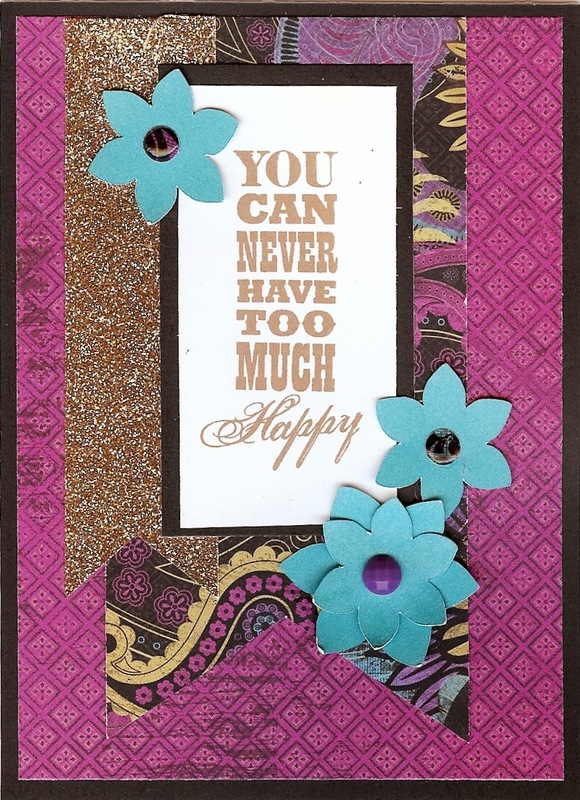 To make the other two flower centers, I used a 1/4" single hole punch (like you use in school) and punched a little circle out of the zip strip at the top of the Laughing Lola (paisley) paper. After attaching it to the flower, I used a blob of Liquid Glass and made it hard and shiny. SO COOL! Most people in class didn't even recognize it as just the paper in the kit with a little Liquid Glass. Love using old stuff for a new look!! 1. At the bottom of your strip find the approximate center, cut about 3/4" up with your scissors (or 1" or more, if you want a deeper "V" at the bottom. 2. Now cut from the corner of the strip to the top of your center cut. 4. Your banner should be even! (HOORAY!) Sometimes after I make the center cut (#1), I turn the paper over (because I can't see where I cut). This is especially true with the busy paisley pattern. Good luck - have fun! And keep stamping!! I'm SOOOOOOOOO excited, my new Spring Catalog is here!! I know, I know, you can't judge a book by its cover...but really, this one has lots of fun great stuff in it! There's seven new paper packs, over 65 new stamp sets, Cuttlebug embossing folders, new accessories, new OWL stamp sets (yippee! 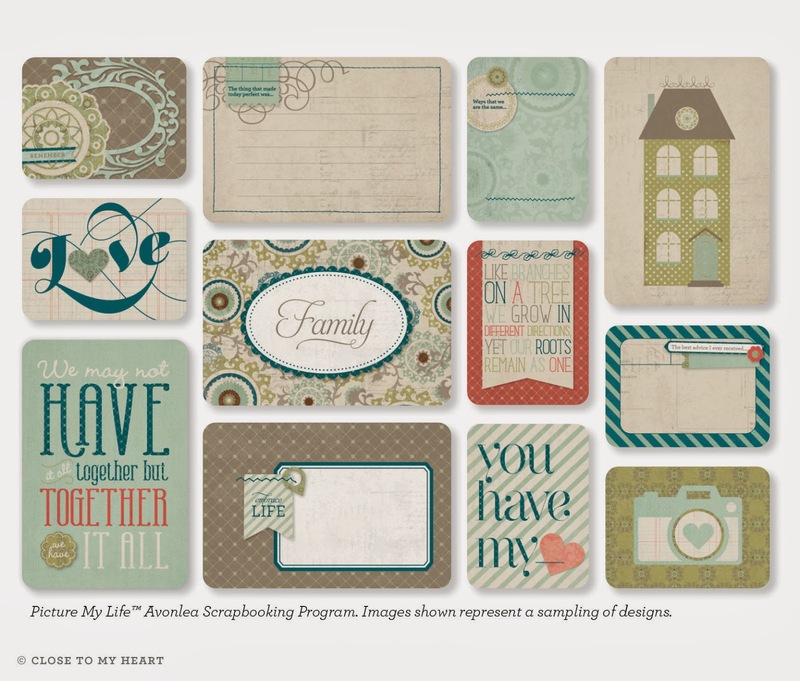 ), a Picture My Life Scrapbooking Program (like Project Life - easy, easy memory keeping with no adhesive required), Crush Books (like Smash Books - fun little binders with cute papers and designs), and LOTS MORE! It's nice that they've coordinated the papers with existing papers, so you can add your own papers to your scrapbook, if you want. 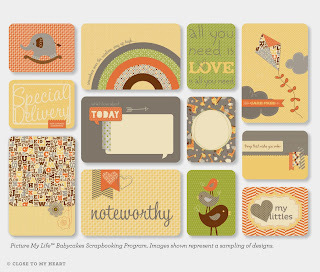 Picture My Life - Babycakes - I love set this better than the actual paper pack! We'd love to see you!! We'll be making some FUN cards with the new goodies! Let me know if you are in the Seattle area and want to join us!